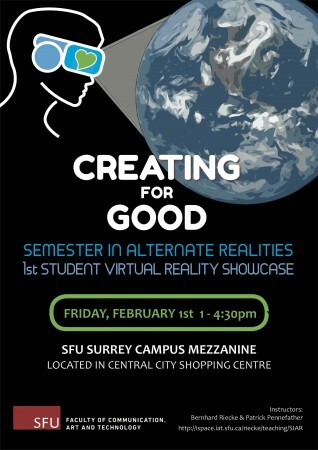 The Semester in Alternate Realities team is proud to present our stu­dents’ 1st show­case on their Virtual Reality for Good projects (“VR4Good”) in the Mezzanine on our SFU Surrey campus, on February 1st from 1:00 — 4:30 pm. These works were cre­ated by stu­dents from dif­fer­ent SFU depart­ments who joined our Semester in Alternate Realities. They are part of an emerg­ing field of devel­op­ment and research that use VR and other emerg­ing tech­nolo­gies to increase aware­ness and be a cat­a­lyst for improv­ing our world. Join us and be our first public user-testers for four short and unique VR projects. See our Semester in Alternate Realities web­site for more infos about the course, and our face­book event page for first pic­tures of the show­case, more will follow soon.